LP: How did Jailbreaks come to be? ZW: I’ve always been drawn to the sonnet and had read a few recently published international sonnet anthologies. I found them to be not quite international enough, particularly when it came to Canada. I started mentally cataloguing all the Canadian sonnets that I thought were good enough to be included in these books and realized that there might just be a book in it. So I started hauling volumes off my shelves and bookmarking likely candidates. At this point, I still didn’t have a publisher committed to the project, but Dan Wells at Biblioasis, with whom I’d been working on other projects, said he’d publish it, so I set about doing it in earnest, going to the Dalhousie University library and scouring books for suitable sonnets, typing them out, assembling them into a ms., shifting poems in and out, writing notes on the poems, etc. The whole process played out, in fits and starts, over approximately three years. ZW: As I said, I’ve long been fascinated with the form. It’s one of the few traditional forms that is flexible enough to contain a really wide variety of techniques, subjects, tones. It’s kind of a form-that-wouldn’t-be in that regard; an anthology of villanelles, for example, is almost inconceivable because a blur of sameness would inevitably result. I love how a sonnet argues with itself between octave and sestet, how it works things out dialectically, embodying human thought in its very structure. It’s at once compact and expansive. One of the book’s contributors, Wayne Clifford, is publishing, in several volumes, a sequence of over 400 sonnets–and this after publishing a suite of 52 sonnets a couple years ago; small moments that link into a life. LP: You obviously had to deal with a great many poets and publishers. What was your greatest challenge assembling this book? ZW: The greatest challenge is one I lost. I was denied permission by Elizabeth Bishop’s publisher to reprint a sonnet of hers, on the grounds that Bishop is not a Canadian poet, so including her in a Canadian anthology would “cause confusion.” Technically, in terms of her citizenship, this is accurate; in more meaningful terms, it’s ridiculous, since Nova Scotia was as much, or more, home as any other place for Bishop. I pled my case to the publisher, but they wouldn’t budge. LP: You’ve included a Notes on the Poems section following the poetry. They read as though you had a lot of fun analyzing the different approaches to the sonnet. Did you? ZW: Absolutely. I took my cue from Don Paterson’s anthology 101 Sonnets. I loved his insouciant and often insightful notes on each of the poems in that book and thought it would be a good way to go about things in my own anthology. I had a lot of fun with it. LP: This collection contains poems and writers from very different eras and parts of the country that, aside from its literary merits, makes it a historical document as well. Any thoughts on that? 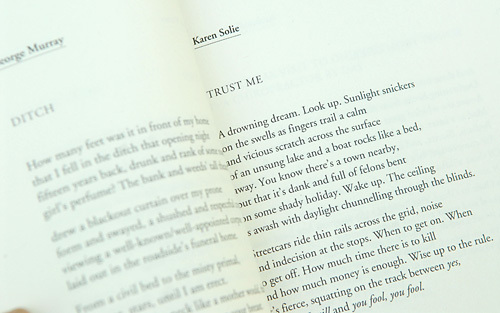 ZW: I suppose it is, though as has been pointed out in one review, about half of the book’s poems are ten years old or younger. Which is itself a documentation of a present phenomenon. One of the reasons the book is chronologically top-heavy is that poets have been turning back to the sonnet in droves over the past decade. The 60s-80s were a pretty dry era for the sonnet in Canada, as orthodox thinking was that writing rhyming metrical poems was passé, or too British, that free verse was the thing now, “open field composition,” lines determined by “breath units” instead of metrical feet. A lot of poets who started off writing in traditional forms abandoned them; and younger poets followed in their footsteps, so that learning how to write a sonnet was no longer part of the formative training poets underwent. As a reaction to the great mass of formless broken-prose free verse that eventually resulted, poets have started more and more looking to the past for fresh new ways of writing poems. The sonnet’s been a big part of that. LP: Further to that question, why no bios on the poets? ZW: I wanted to place the emphasis firmly on the single poem. Most anthologies are about poets, or generations of poets, with photos and bios and all the trappings of quasi-celebrity. This one’s about single, small poems. And besides, with 100 poets, the bios would take up a ridiculous number of pages! LP: It’s always a tough question for an editor but any personal favourites in the book? LP: Jailbreaks is a gorgeous book, sporting a matt cover in a dark red with black accents and lettering in both silver and black. Nice paper inside. Was that a conscious decision when you were planning the book, to make it look and feel more upscale? Who was the designer? ZW: The designer was Dennis Priebe and you’re right, he did do a beautiful job. I have to take some measure of credit for the eventual shape of the book, as I had input on the trim size and the type-setting and turned down an earlier cover design that wasn’t quite working for me. There were some mild arguments between me and Dan Wells over this, but we both agree now, it has worked out well. There wasn’t an aim to make this particular book “look and feel more upscale.” Dan and Dennis and I are just all people who care about the design as well as the content of a book, so the final product reflects that. LP: You’re a poet yourself, why is there no Z. Wells sonnet in the book? ZW: Not enough space! Seriously, I disapprove in general of editors including their own work in an anthology. I have my own private opinions about the merits of my own attempts at the sonnet, but Jailbreaks was not the place to air those opinions. LP: You have your finger in a number of other pies. You’re the Reviews Editor for Canadian Notes and Queries. You’ve written a fair bit of journalism. You also work for Via Rail. What do you do for the railroad? ZW: I work as a host/bartender/guide in the dome car on the train between Vancouver and Winnipeg. I’ve worked a number of other on-train service jobs over the last five years, but that’s been my regular gig the last two summers. LP: You’ve written about ‘blue collar writers’ in the past. Does your employment have an affect on your writing? ZW: My book Unsettled is drawn from my experiences working as an airline cargo hand in the Eastern Arctic. For whatever reason, the train work hasn’t translated directly into many poems. It does give me quite a bit of time off in which to read and write, however, which has been crucial to getting things like Jailbreaks done. Though I’m a big fan of several poets who have used their work as subject matter for their writing, I have no special interest in “blue collar” writing as such–like anything else, most of it’s not very good–and my own writing has gone in different directions in recent years. LP: You do have the obligatory writer’s blog but unlike many you manage to keep it up to date and filled with varied content. It has the wonderful title of Career Limiting Moves. How did that title come about? Do you find the blog useful? ZW: The name of the blog is a two-pronged joke. When I quit working for the airline up north, I sent a letter to my bosses outlining what I considered to be significant misjudgments on the part of company management. It later got back to me that one of my bosses had called this letter a real “career-limiting move.” This was hilarious to me, since what else would a resignation letter be? The other facet of it is that most of the journalism I do is book reviewing, and if you’re going to review books honestly, which I always try to do, you’re going to piss off people from time to time, so it’s not a great way to get ahead in the literary sphere. I like having the blog as a place to air opinions, new poems and promotional announcements–or just the odd strange thing that caught my eye. I guess it’s useful, insofar as it keeps me in touch with a readership, but I keep it up because it’s enjoyable. LP: What’s next for Zachariah Wells? ZW: Well, as I type this, my wife (writer Rachel Lebowitz) is in the early stages of labour, preparatory to the birth of our first child. I reckon that will take a fair bit of time and energy! A children’s book that Rachel and I co-wrote, illustrated gorgeously by Eric Orchard, will be released by Biblioasis in September. I’ll be doing some promotional stuff for that, as well as for Jailbreaks, over the fall. Next year, I’m supposed to publish a new collection of poems and a collection of critical prose. 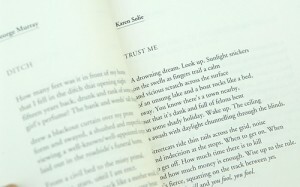 I’m also editing a couple of books, including a selection of poems by the late Nova Scotia poet Kenneth Leslie. Rachel and I (and baby) will be moving back to Halifax from Vancouver next spring, too, so it’ll be another jam-packed year. 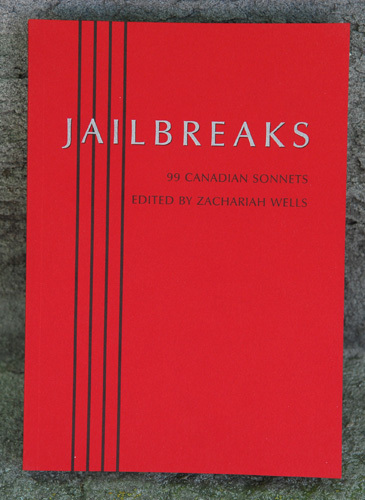 “Jailbreaks” is a great little anthology. I’ve enjoyed a number of the poems. Standouts for me so far are Barbara Nickel’s “For Peter, My Cousin” and Don Coles’ “Sampling from a Dialogue”. I agree, Brian. As for favourite poems, I’d have to say David McFadden’s “Country Hotel on the Niagara Peninsula”, Alden Nowlan’s “St. John River”, and John Smith’s “There is One”.